Excavation is destructive, and so should only be considered as a last resort. To excavate archaeology is also to destroy it. In some cases, of course, for example in developer-funded commercial archaeology, excavation may be an appropriate option to ‘preserve by record’ a site which would otherwise be destroyed by development. Our study sites are irreplaceable, essential elements of their own landscape. Many are popular visitor attractions or well-known local landmarks, and all are protected Scheduled Monuments. The aim here is to “extend the histories” of round mounds – to understand their date and their development, perhaps even revealing histories stretching back through multiple phases of use and re-use over millennia. Only non-destructive methods will do. Using the jacking mechanism to recover the chamber. 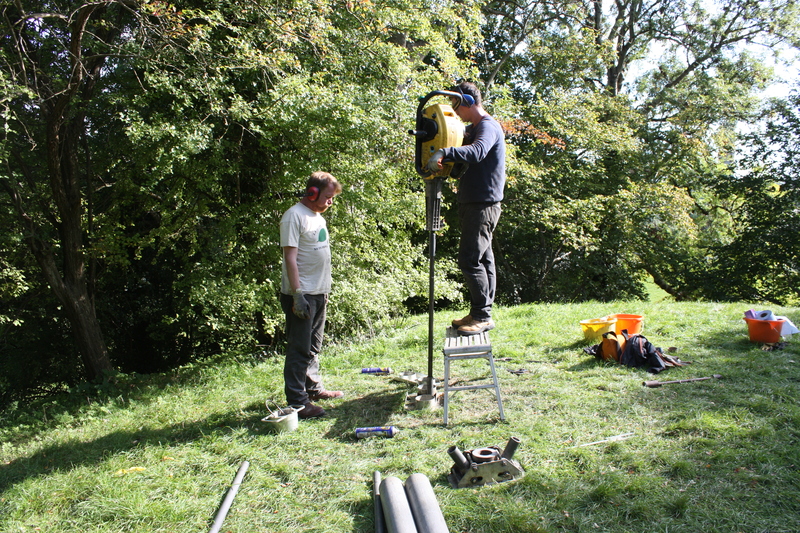 Power auger borehole surveys provide a way of studying the fabric of the mounds with minimal disruption. 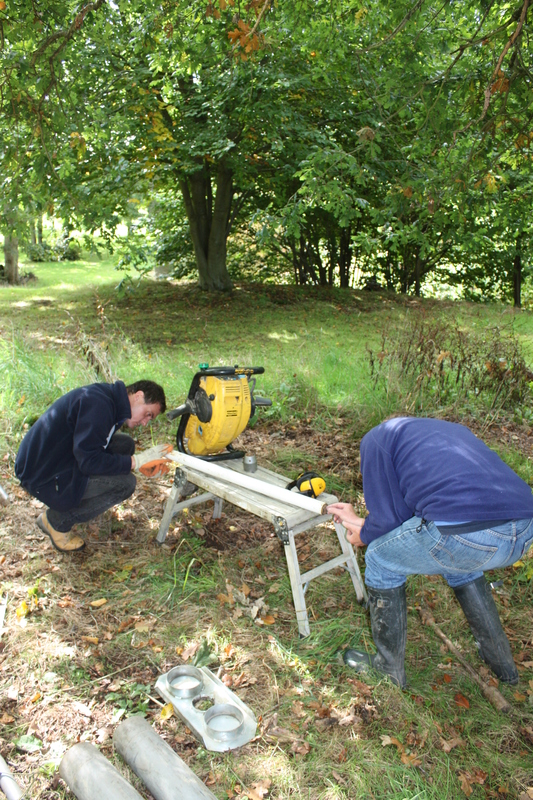 Using the power auger equipment we are able to gain an insight deep into the mounds, to recover material for laboratory analysis, whilst at the same time preserving the integrity of the monuments for generations to come. 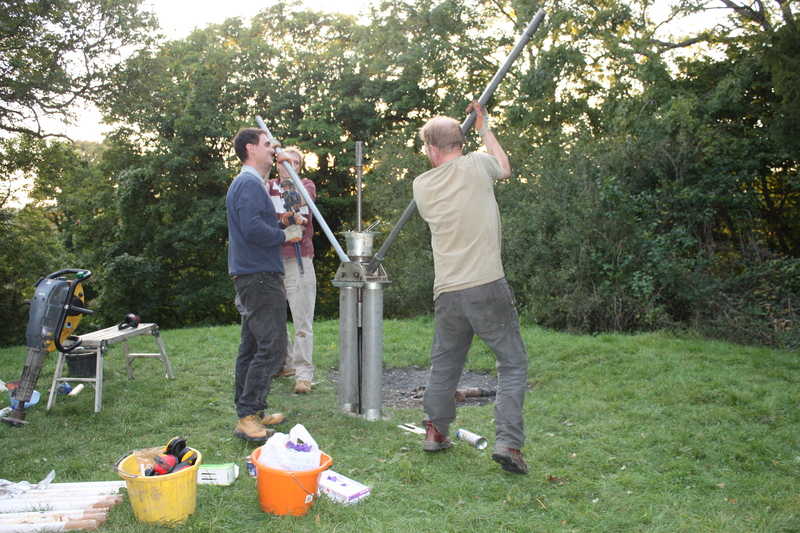 The method itself is relatively straightforward: a 55mm diameter steel tube (the core sampler) containing a length of plastic tubing is driven into the ground using a powered drill (actually a petrol-powered concrete breaker). Once the chamber is pushed down a metre, the chamber is pulled out of the borehole using a jacking mechanism much like a lever corkscrew. The plastic tube containing the core of sediment is then removed from the sampler and sealed in cling-film and packing tape before being transported back to the lab to be sawed open and examined. Meanwhile, the core sampler is loaded with another plastic tube and sent back down the hole to take the next metre-long core, adding one metre steel rods as drilling continues until the solid geology beneath the mound is reached. Once the borehole is completed, the hole is backfilled with fine gravel and bentonite clay pellets. Sneaking a peek at the ends of a core encased in a white plastic tube.